Dimensions.-Main axis of the cortical shell 0.18, equatorial axis 0.07; breadth of every chamber 0.09; meshes 0.003 to 0.01, bars 0.002 to 0.004. Habitat.-Comopolitan; Mediterranean, Atlantic, Pacific, in various depths. Basic shell consisting of two concentric medullary shells joined to the equatorial constriction of the figure-8 cortical shell (cylindrical to ellipsoidal latticed shell divided into two approximately equal halves by an equatorial constriction) by 15-20 or more cylindrical radial beams arising from the surface of the outer medullary shell and confined to the equatorial region. Inner medullary shell spherical with subequal, polygonal pores, 3-5 on the half circumference; joined to the outer medullary shell by numerous radial beams. Outer medullary shell ellipsoidal, compressed in the polar axis, with subequal, circular to subcircular pores, 7-9 on half the major circumference. Pores of the cortical shell variable, relatively large, polygonal, subpolygonal, subcircular, or with irregular shapes, with or without polygonal frames, nearly equal with subregular arrangement in some specimens to unequal with less regular arrangement in others, slightly smaller in the region of the equatorial constriction, 7-12 on half the circumference of the broadest part of the shell. 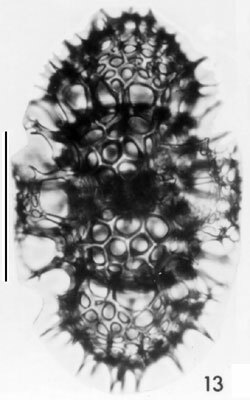 Surface of cortical shell with numerous thorns or cylindrical spines, some or all of which are branched distally in most specimens, representing rudimentary structures of the secondary shell; surface rarely devoid of spines, always with relatively stout thorns if spines lacking. Secondary shell consists of the latticed polar caps and one or two outer latticed mantles; represented in various states of development (P1. 8, figs. 8-13; P1. 9, figs. 1-2) from absent but generally rudimentary to the form illustrated in figure 10 with three polar caps at each pole and two outer mantles; the latter form is not complete because there are spines on each of the third caps (indicating a fourth cap) as well as a few spines on the outer mantle. No specimen was observed without some structure indicating either additional polar caps, an outer mantle, or both. First polar caps supported by numerous radial beams whose points of origin define an approximate polar circle on the cortical shell; second and third polar caps supported by similar beams which are less constant in their position on the preceding cap but generally define a polar circle. Caps of variable shape from subhemispherical, to subconical, to irregular in outline; with pores similar in shape and arrangement to those of the cortical shell but slightly smaller. First outer mantle developed between the distally branched spines of the cortical shell, generally cylindrical but with irregular surface, relatively thin-walled, with unequal, generally very small, irregularly arranged pores of all shapes; it tapers at each pole, merging with the lattice of the first polar cap; if a second cap is present the mantle is double-layered at each pole, the outer layer merging with the lattice of the second cap (fig. 10). Second outer mantle with lattice similar to that of the first, joined to the first mantle by numerous cylindrical beams, tapers at each pole merging with the third latticed polar cap if present. Measurements; based on 38 specimens from stations 46, 81, and 92: length of specimens with one cap at each pole (16 specimens) 172-252 µm, with two caps at each pole (9 specimens) 232-317 µm; maximum breadth of first outer mantle (18 specimens) 135-178 µm, of second outer mantle (5 specimens) 178-196 µm, of polar caps (14 specimens) 68-105 µm; length of cortical shell 102-141 µm, maximum breadth 74-104 µm; diameter of inner medullary shell 11-16 µm; polar diameter of outer medullary shell 26-31 µm, equatorial diameter 3l-37 µm. ....specifies, in connection with something previously mentioned, another or a different thing, and leaves the preference between the two to be decided by subjective opinion or choice..
specimens, page priority requires assignment of the Gulf species to Zygocampe chrysalidium. The illustrations of several species and genera of earlier workers conform to several of the ontogenetic stages of the Gulf species. Without study of the type material of these apparently "ontogenetic" species and genera, however, they were not placed in synonymy with Zygocampe chrysa1idium because they may represent ontogenetic stages of other valid taxa. In the writer's opinion, study and revision of this group of forms with figure-8 cortical shells will reduce the number of genera and species to only a few. Distribution. In the Gulf this species is cosmopolitan, being present at all stations except 203, and 214. It is rare at all stations except 90 (7.4%), 92 (2.4%), 184 (2.2%), 194 (7.5%), and 206 (3.0%) where it is common. At stations 90 and 194 it is the fifth most abundant species. In general, its frequency in the southern Gulf is slightly greater than that in the northern Gulf, but its frequency at stations 90 and 194 is much greater than its average throughout the Gulf. Its increase at station 90 may be explained by upwelling in this region. The increase in its abundance at stations 194 and 184 may be explained by its tolerance for higher than average salinity and temperature, although upwelling may be important in this region except that there is no direct evidence that it occurs. It is of almost common occurrence in the southern Gulf; therefore, it is an important member of the tropical Pacific fauna. Because the taxonomy of this species as well as of forms similar to it is poorly known, little can be said about its world wide distribution. The basic shell with or without polar caps has been reported by numerous workers from the tropical parts of the world's oceans. The writer could find no reference to its occurrence in high latitudes; therefore, it may be confined to tropical seas.